Would you endure a single interactive advertisement in exchange for an hour of uninterrupted streaming music? Pandora hopes so. The streaming music service has concocted a new type of advertisement, called Sponsored Listening, that’s meant to reward users who actually pay attention. Users who choose to participate must spend at least 15 seconds with an interactive ad, and the sponsoring brand then foots the bill for an hour of commercial-free music. 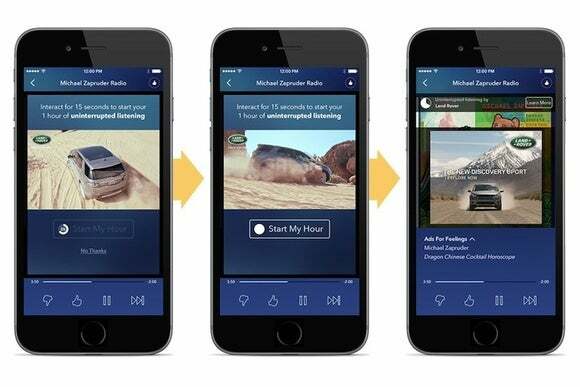 Pandora has been beta testing Sponsored Listening since last September, and is now opening it up to all advertisers. An ad from Land Rover, for instance, asks users to swipe on the screen to view the vehicle from various angles. Users might also be asked to swipe through multiple information panels—Pandora’s advertising site shows Red Bull as an example—or to sit through a video. New partners in the public launch include Corona, Gatorade, truTV, and Yuengling. Pandora says the program has been a win-win for users and advertisers in the beta phase. Users have responded well to the option for ad-free listening, which normally requires a $4.99 per month Pandora One subscription, and brands have seen a better return on investment compared to regular banner ads. If the idea of mandatory brand engagement makes you a little queasy, the good news is Sponsored Listening is option. You can also tap “No Thanks” on an offer to jump into the usual ad-supported stream. The story behind the story: Although Pandora’s Internet radio service has been around for nearly a decade, it has yet to turn an annual profit since going public in 2011. And with the recent launches of Apple’s Beats 1 radio service and Google Play Music’s free mood-based radio stations, Pandora is arguably under greater pressure than ever to turn things around. Sponsored Listening may not be the ultimate solution, but it is one way to boost revenues without killing the experience for users.